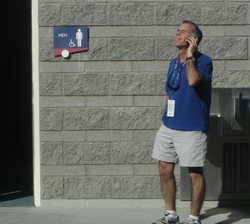 Respected veteran baseball analyst Tim Kurkjian files a report on ESPN Radio Tuesday morning from his offices in Maryvale, Ariz. 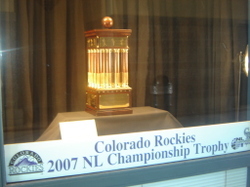 Prominently displayed in the concourse of Hi Corbett Field in Tucson: the Colorado Rockies' 2007 National League Championship trophy. TUCSON, Ariz. -- Seventy-two degrees. Arizona mountains in the distance. 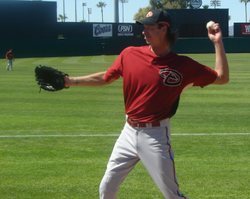 Randy Johnson making his first Cactus League start. Diamondbacks-Rockies. Not a bad day. Not a bad day at all. Perhaps there is one other place even more than a spring-training baseball game where I'd like to be Monday. 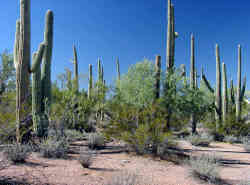 The saguaro cacti in Arizona are outnumbered by only one other thing here, it would seem: developed property. Photo courtesy Arizona Desert Museum. 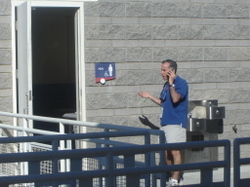 PHOENIX -- Reporters from a Tokyo television station interview former Midland RockHounds and current Oakland shortstop Bobby Crosby during workouts Sunday at the A's spring training complex at Pheonix Municipal Stadium. The Oakland A's will meet the World Series champion Boston Red Sox for four games to end the pre-season and then in two games to open the regular season in Tokyo. 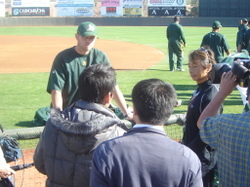 The Japanese station sent a contingent of six reporters and photo journalists to cover the A's training camp. Ran into a man on the concourse who moved to Surprise from Illinois several years ago and his brother Mark Thomas lives in Midland and works at Plains Marketing. Anyone who knows Mark tell him Steve says hey. 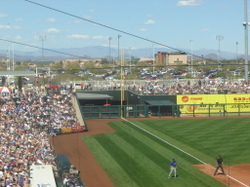 Sports writer Jack Marrion is watching the A's play the Brewers today at Phoenix Municipal Stadium. I''ve never been to Phoenix, but am amazed at how absolutely huge this place is. HUGE, I tell ya. 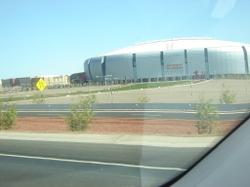 And The University of Phoenix Stadium where they are probably still cleaning up after hosting the Super Bowl, is as big as it appeared to be on TV. More later. Tomorrow from Tucson, the Rockies and hopefully some video from Midland HIgh graduate Jayson Nix.